This review is a difficult one for me to write. When I finished reading Cooper’s Promise, I was full of thoughts and opinions and it’s hard to know the best way to express them all. First off, the book is extremely well written. The author has an incredible way with words and has the ability to paint the landscape for the reader. I had no problem visualizing this fictitious country of Lalanga and all of the horror that went along with it. But that clear picture was also what made it a little difficult to read at times. I had to take breaks so my heart could toughen up between scenes of broken children and child prostitutes. It was a relief to finish the book for the wrapped up ending as much as for the reprieve from the sadness. Because of the theme of the book, the language that was used was uncomfortable at times. I’m not a fan of cussing and there was plenty of ‘f-bombs’ scattered throughout, along with some crude vocabulary choices during some intimate scenes. This was the first book I’ve really read that had the main protagonist as a gay man so I’m not sure if the crude language was because of that or if the author was trying to keep the rough feeling of Lalanga in all aspects of life, including something that should be sweet. In any case, I didn’t care for the language but I was fascinated with the developing romance between Cooper and Sadiq. I think it helped give Cooper something to focus on other than his circumstances and the promise he made that he struggled so much to keep. Cooper was a fascinating character. I liked how the author slowly leaked his backstory to help the reader to understand his history and what drove him to feel so protective of one particular child prostitute, Lulay. If I was stuck in a frightening situation like that, Cooper is definitely someone that I would want to have around to fight for me. 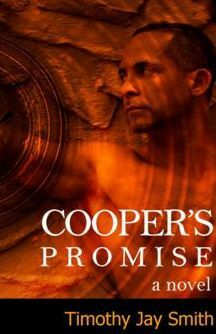 As much as I enjoyed the overall story of Cooper’s Promise, I’m not sure it’s a book that I could recommend to just anyone. It would have to be for readers who aren’t naive to the way certain parts of the world work, who wouldn’t walk away haunted by the intense and sad world that Cooper finds himself a part of. If you can handle an intense read, give it a try. Win a Margaritaville Frozen Concoction Maker!